We are past the darkest time of the year again, the days are already slowly getting longer. But it will take a long time before we notice that it really is getting lighter again. In winter it is more hazardous to cycle than in summer. That is not because of motor traffic. The separate cycling infrastructure reduces interaction between motor traffic and people cycling to an absolute minimum. Snow and ice are also not what comes to mind first in this country, because we sometimes have winters completely without any snow and ice. (Last winter was such a very mild winter.) There is the cold and the wetness, but you can dress for that and that is also no different from any other season. What we do always have is the winter darkness. People of all ages and backgrounds pass this area in high numbers. The way people are dressed gives away that it was cold. It was just under freezing point when this was filmed. Being on the latitude that The Netherlands is on, it means we have a big difference in daylight hours when you compare summer with winter. It is not so dramatic as in Finland, but even here, the longest day in summer is nine hours longer than the shortest day in winter. And that is just looking at the times of sunrise and sunset, not taking into account that there is a much longer dawn and dusk in winter and that a dark winter weather can make it much darker too. It means that in a large period in winter both the morning rush hour, as well as the evening rush hour, take place in the dark. There is a large difference in daylight in summer and winter. The two are not their exact mirror because we shift the clock one hour in summer. What is clearly visible is that in winter both morning as well as evening rush hour takes place in the dark. That’s why we have laws that when you cycle there should be working lights on your bicycle. Not everybody has working lights and luckily for these people we have this traffic system in which there is only little interaction between motor traffic and them in general. But it is not a very bright idea (ahem) to cycle in the dark without lights on your bike. Hi-viz is not necessary. There are three people cycling by in hi-viz in the video below. 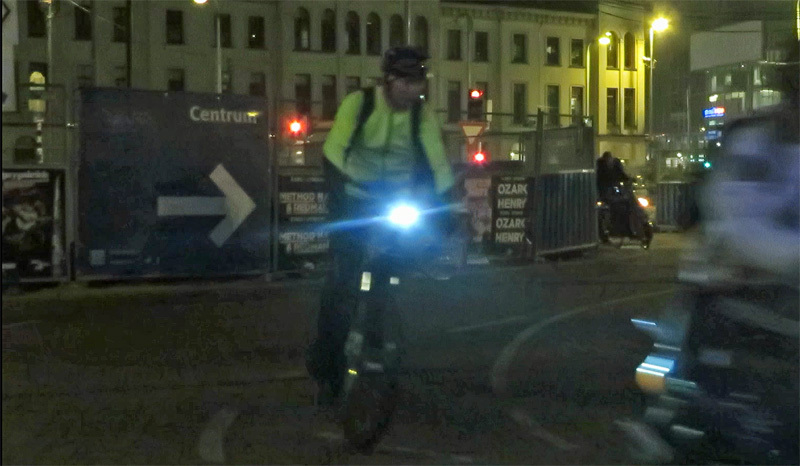 And it is interesting to see that their hi-viz doesn’t really help them to be more visible in a group of cyclists. Only when car lights hit hi-viz it starts to radiate. Bike lights don’t do that trick. So in a society where most of the cycling takes place away from motor traffic hi-viz is pretty useless. The dangers, this time of the year, are hidden in cracks in the surface. And they come from bollards obscured in dark shadows, kerbs which are almost invisible due to the lack of contrast and all kinds of such obstructions that simply cannot be seen well enough in the darker environment. If hi-viz is not illuminated by car head lights it is just as visible as normal clothes. So hi-viz is pretty useless in an environment where car traffic and bicycle traffic is very much separated. As with the nights in this time of the year, my video this week is very long as well. I was inspired to make this video by Chris from the “I love biking SF & OAK” blog. He visited The Netherlands for a month last November to cycle off-season as if he was a Dutchman. 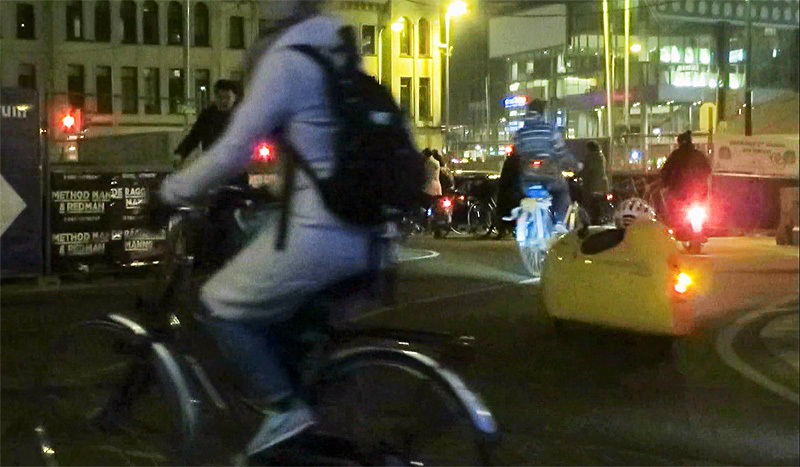 We rode through Utrecht during a dark rush hour and it was great to see his enthusiasm. He almost didn’t want to leave this place, because he was mesmerized by wave after wave of people passing by on their bicycles. I can see why it is so appealing. There is almost no other sound than that of the bikes rattling as people ride by. The sounds of motor traffic crossing in the distance don’t reach us, or only occasionally when a bus honks. Bus drivers can get impatient, but if you look carefully you can see that the light for cycling is green sometimes, when buses are still in the way. So these bus drivers should perhaps not honk so fast: their own behaviour is also not always as it should be*. A velomobile ‘in the wild’ is a rare sight. Two interesting vehicles pass by in this video. A tandem (6:57-7:02) and a velomobile (10:54-11:13). I have caught tandems before, but a velomobile ‘in the wild’ is even more special. This is near Utrecht’s Central Railway Station. And because of all the building activities all the bicycle traffic gets funnelled to this particular spot, making it the busiest place in the entire city. You may think it all looks very peaceful and safe, and it really is safe. But it is telling that you hear only a few conversations and that of these few conversations, most are about the traffic situation and about how busy and ‘dangerous’ it is there. I will translate some of the remarks you can hear. At 02:21 a girl jokes: “Joeh, en weer overleefd” which means “Phew, and we survived again”. At 05:34 a girl curses at a moped rider. Who was honking, presumably at her. She shouts “Jezus!” which needs no translation I think. She is assertive enough not to move aside for the moped rider. At 08:20 a man sees the light turn green in the distance and he shouts to his friends “Hop, naar het groene licht!” which could be translated as “Come on: let’s try to make it through that green light”. At 10:30 you can hear a man say: “Ja het is hier altijd druk”, “Yes it is always busy here”. Which sounds like an answer to someone who is surprised about the traffic volumes at this location. At 12:55 a man and a woman have a similar conversation: “Het is altijd druk hier. -Ja. -Dit is echt…” He: “It is always busy here.” She: “Yes”; He: “This really is…” and the rest of his sentence gets lost in the night. This person carries two large instruments on his back! But it is all about perspective. Objectively it is not so dangerous here. If there were cars as well, it would be really dangerous, but perceived danger is bad enough. It is a good thing that by the end of 2015 this building site will look very different. This area should be finished with a permanent type of infrastructure that should be suited for the high volumes. There will also be more routes, so traffic will be thinner at every location. The people cycling in Utrecht can’t wait. 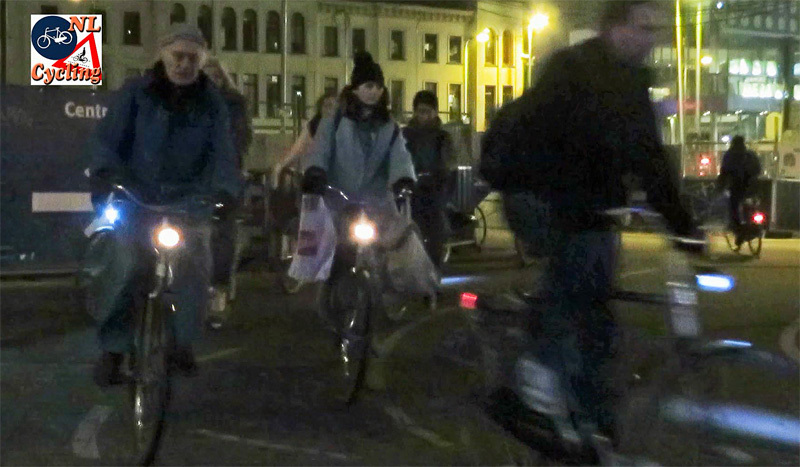 A 15 minute video showing the evening bicycle rush hour at Smakkelaarsveld in Utrecht. How terribly dangerous the buses in the distance can be, was underlined the same afternoon this post was published. As I rode to the station after work, the whole area was closed by the police. In the distance I could see a bus and an orange sheet that was held up to prevent people from seeing what nobody wants to see anyway. I could only suspect someone was under that bus. That proved true. A six year old boy on his bicycle was run over by the bus and he was pinned under that same bus. A helicopter arrived and landed to get the boy to a hospital as quickly as possible. But it was too late. The boy did not survive. An investigation has started. 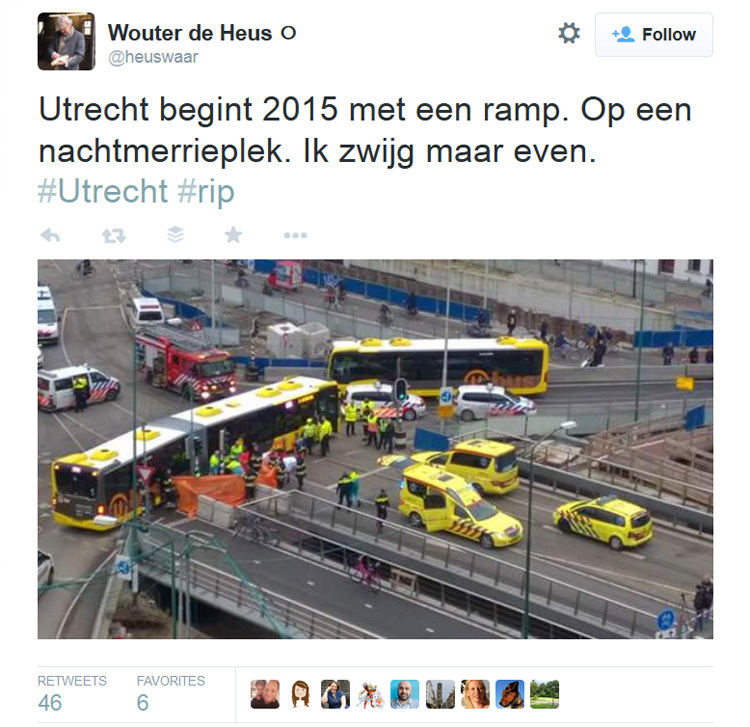 A very tragic start of the year in Utrecht. Because people asked whether the crash happened at the location of the video I published this update. It is not the same location, but it is close. The crash site is not the location shown in the video. The video shows a place about 25 meters further to the north (left hand side of this picture) where only bicycles ride. This crash occured on a traffic light controlled crossing with a bus track. In 2015 my regular posting time will move from Thursdays to the first minute of Tuesdays (Central European Time). This was the first post that was published on that new time. Lots of comments on your films are about how we in NL don’t do hi-viz clothing (or helmets, but that’s a different discussion). But perhaps it would be a good idea to explain how not our riders but our bikes have hi-viz: reflectors on the rear, reflective tyre rims, reflective pedals. These make most Dutch bikes stand out in car head lights. Perhaps you could do a video about that someday, Mark? What a very sad and unneccessary tragic accident that was. Poor boy, and of course, how terrible for the parents who are in my thoughts here. It reminds us that even in NL, nothing is perfect all of the time, and accidents do still occur sometimes. As for the night cycling, I agree with Theo that it is amazing that cyclists who feel they must stop to give way for a moment, do so with such confidence in a small one metre space amongst all the motion around them!! The confidence of most daily cyclists here is quite impressive, even to me who is a little part dutch! I have never seen such complex confidence at a cycle junction here in the UK. I am also impressed not only that so many have working lights (even though of course, it should be mandatory by law), but the fact that they still do so in an urban streetlit area! 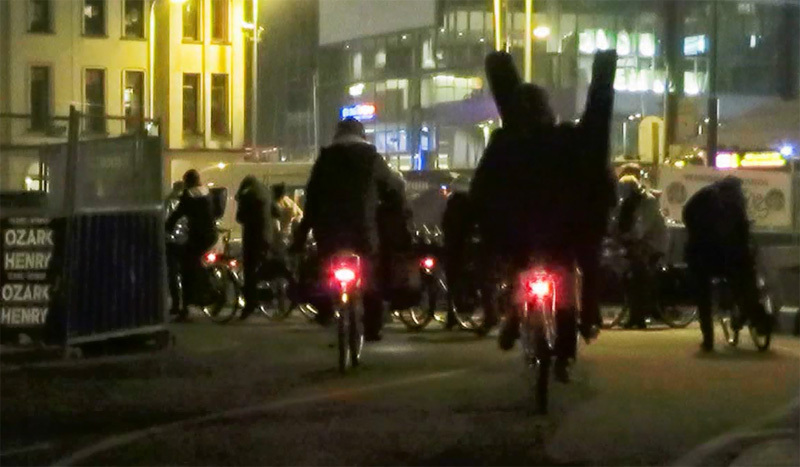 In the UK, so many cyclists riding after sunset do NOT have working lights in urban areas, because they feel that street lighting is sufficient enough for their purpose. This of course is not acceptable, or sensible, by an increasing minority in the UK. Were it NOT to be mandatory law to have lights in NL, I still sense that the vast majority of dutch cyclists would still use them on their bikes as sheer common sense. I conclude this to be due to the big difference in overall attitude (or culture) that the Netherlands lives by. By the way, I am a little surprised that mopeds were permitted to speed through such a concentrated junction with tight narrow bends. My only critisism. As a teenager I had a little Pifco light: I had to hold it onto its bracket every time I rode over the speed humps. I spent my pocket money on ‘quality’ Eveready lights. To fix them to my pannier rack and still be able to use the panniers I had to mount them sideways or upside down and use complicated brackets bought (more in hope than expectation) by post. Rain fell into the drainage holes and corroded the connections so there was a 30 second delay after switch-on while the ‘electrochemical circuit’ started up. Fitting front lights in combination with a basket also proved a fiddle. LED lights came along with longer battery life, but they were illegal as they did not meet BS regulations on reflectors. They were still just as hard to mount because Cat-Eye assumed that I was a tall chap who would fix them to a long bit of free seat post (in your dreams) and that I wouldn’t obscure them by wearing a long coat or carrying stuff on my pannier rack. I couldn’t tell what mounting was provided until I had torn open the packet, nor could I tell how bright the light was because of inconsistent or absent information. In some cases I even found front ‘white’ lights had green or orange LEDs. Over the years handlebar diameters have changed so clamps don’t always fit or they slip along tapered bars or they get in the way of the kids’ ‘must-have’ bells and bike computers. Only the other week I went to the local bike shop to buy a light -not expensive, but not really cheap: £15 -it wasn’t waterproof. I have spent hours and hours of my life trying to find lights and reflectors that fit to kid’s bikes, tag-a-longs and so on. It is still really hard to find out whether a light is going to be legal, bright, reflective, waterproof, have a reasonable battery life and actually fit. My collections of clamps and brackets (even from lights of the same make) are all mutually incompatible. I have had dynamos, but they can be pricey and you need to go to a lot of trouble to fit them -especially on kid’s bikes. My ‘cutting edge’ Shimano dynamo that I bought so proudly years ago and which fixed under the bottom bracket, was plagued by slippage (from the mud and wet -yes, I should have spotted that). There is always a dilemma -do I have quick-release lights that are a doddle to steal unless I take them with me every single time I pop into a shop or do I bolt them on? Probably no one will unbolt cheap lights, but if they are good ones…? The latest lights frequently have USB charging ports -sounds great, but what do I do when we pop out to go to a swimming lesson and suddenly realise that one of the kids’ lights needs charging? In the NL bikes come with rear carriers and dynamo lights already fitted -it actually takes an effort to NOT have lights. Most Dutch collisions are not accidents. Many of them could unfortunately have been foreseen. Some genuinely are a surprise to everyone, but most are not. Many are on streets that do not yet conform to Sustainable safely, like the intersection near the S’Hertogenbosch hospital where an American pick up truck driver got out of control and hit several young cyclists waiting at an advance stop line. The driver was at fault, he made the truck go way too fast, but an advance stop line is really not the best solution for an intersection. Or the location where a cycle lane still needs to be updated to a cycle path, maybe where traffic is going to be diverted so that the original route can be downgraded. I find it amazing that people can be so willingly obnoxious to ride a motor scooter through there. Probably they’d be SUV drivers over here. This is an amazing ballet. Everyone is alert and focused on their surroundings. They are in a sense negotiating their space and path among the other people. The negotiations are instantaneous. A certain level of expertise and cycling skills are also required. It’s encouraging to me to see people functioning like this. I also enjoy watching the webcam at Koningsplein. https://www.terena.org/webcam/ There are no traffic lights or anything here. But everything functions smoothly. Another encouraging human ballet. People around where I live are not so aware of their surroundings. They walk out of stores without looking and become angry when a car almost runs them over. They walk behind cars backing out in parking lots. They almost run their shopping carts together in stores or block the aisles while they study the soup selections. Very discouraging. I certainly enjoy your postings! Thanks for the snippets of conversations and the times they appeared. I am learning Dutch so it was fun and helpful to hear that. As inhabitant of Utrecht I know this place very well, but tend to get disorientated and find myself back at another side of the jungle than I expected. Still, I was mesmerised by your video. Mandatory study material. Please note that most conversations in the video do more or less continue despite the “dangerous” situation. This suggests that there is a high level of routine and experience for most rush hour cyclists at that spot. So it is not seen as “dangerous” but “difficult” and annoyingly slow. More positive lessons from this video. Pedestrians walk through this chaos more or less uninterrupted like some higher form of magic. Cyclists can find a waiting spot of just one square meter, being completely surrounded by moving cyclists. There are continuously between some 5 to 20 or more conflicts visible. All are resolved in a highly peaceful manner. Now imagine that all these people were driving a car. Then this knot of multiple crossing roads would have been a living nightmare for the whole city. And no pedestrian would have crossed here without traffic lights, adding to the grid lock. The waiting time at the traffic lights can be very long at times. So traffic light jumping is seen too much. With a very sad come out at some occasions as written above. My condoleances to the parents of this boy. I am surprised that gas powered mopeds are allowed on the bike path. It is amazing to see this level of bike traffic. The busiest commuter bike lanes here in Seattle are a trickle in comparison, but it grows every day. Traffic in the downtown area gridlocks, making bikes faster than cars and far easier (and cheaper) to park. We have bike share now too. We need bike escalators for our 100 meter hills 🙂 I was biking in New Orleans the week before Christmas and the flat terrain was so different. Everyone rides cheap single speed cruisers. Only “slow” gaspowered bikes are allowed on the bicyclepaths and tracks, because those mopeds are reduced in speed to 25 km/h/16 miles/h. The 45 km/h/29 miles/h mopeds have to use the carriageway. In practice those “slow” mopeds have their speeds increased to 45 km/h or more. The Cyclist Union tried to convince to politicians to put alle mopeds on the carriageway, but it was turned down. The city of Amsterdam is aware of the mopedproblem for a long time and wanted to inpliment this measure in Amsterdam. However, it is a federal law, so Amsterdam couldn´t do anything about it, unfortunally. See the video about the mopeds. I m living in Utrecht for 10 years now, and passing this crossing on a bike twice a day. Al of the scooter bikes, also the 45 km/h are allowed to ride on this bicycle path ( particularly on this peace of 600 meters). A not allowed only, they are obligated an prohibited on the car way next to the path. I don’t understand the logic of this. As a fellow “Utrechter” I’m also very familiar with this crossing. There is a good reason to have the mopeds/ scooters in the bicycle lane here. The other option would be to let them use the bus lanes. They are no match for the dense bus-traffic in this area. That would be way to dangerous. In this crossing because of the dense traffic the mopeds are pretty much forced to adapt any way. I am no fan of the mopeds however. They are far to noisy and stink to much. I liked the electric one passing at 4:26. What do you mean by federal law? Netherlands is not federal, and besides, the Netherlands now allows municipalities to chose whether to allow light mopeds (blue number plates) are allowed on the non-combined cycle paths. Amsterdam has banned them. I suggest just removing that categorization, make all mopeds go 45 km/h or the speed limit if lower, send them to the regular roads and only if the speed limit is higher than 50 km/h do cyclists and mopeds mix on designated cycle/moped paths where mopeds must go no faster than 45 km/h. The reason light mopeds existed at all has now been superseded by electro-fiets, or E-bikes, bicycles in every way shape and form except there is a battery and an electric motor, limited to go no faster than 25 km/h. Speed tables on cycle/moped paths can help take care of speeding mopeds, as can speed cameras. Nice entry again. But maybe you could have used some words to describe the ‘dangerous’ traffic situation, as the people in the clip are complaining for some good reasons. I agree it is not life threatening as there are no cars involved, but the temporary bicycle paths are the worst design I have experienced so far in Utrecht. The many intersections in one spot, difficult viewing angles because of the building fences, unclear pathways. I am surprised as Utrecht usually has decent temporary bicycle paths during construction, but these around Central Station Utrecht are just the worst. It shows that it’s important to have multiple cycle routes through an area and not to funnel it all through one spot. Here in Vancouver there are a few places because of geography and rail yards where the cycle traffic is funnelled into a single street or path. It’s okay but as cycling is growing in popularity it’s starting to show how it cannot handle the amounts. There needs to be more than one way by bike through any area. This entry was posted on 6 January 2015 by Bicycle Dutch in Original posts and tagged dark, rush hour, Utrecht, watching people cycling, Winter.